Don't these look incredible? I am amazed how they turned out. I can thank my third grade teacher for this idea!! Don't you want to know how to make these? Keep reading. We collaborated with Rachelle from Tinkerlab and she has some amazingly beautiful Vegetable Dyed Eggs too, be sure to check them out! Click on the link after this post! First of all you'll need some uncooked white eggs---no need to hard boil them because this is part of the process. Next, choose red/yellow onion skins and spinach to surround the egg. Then within those items place rice, barley, lentils, and any other textured food item that will not disintegrate while cooking. I happened to have some cooke spaghetti and that made some awesome textures! Also, you can smash some blueberries in there too. We did some but, I wish we would have added more. Next time! Cassie enjoyed picking out all the items but she was a little confused with what we were doing?? I had to explain to her that the food has "paint" in it and that it will make the eggs a color! 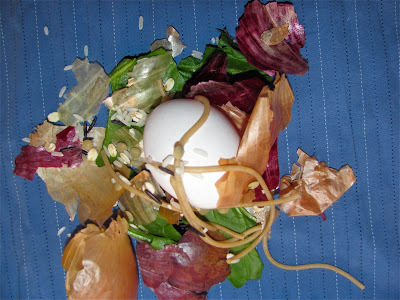 Also, that the spaghetti (which she wanted to eat) and other textural items would create a pattern or design on the egg! 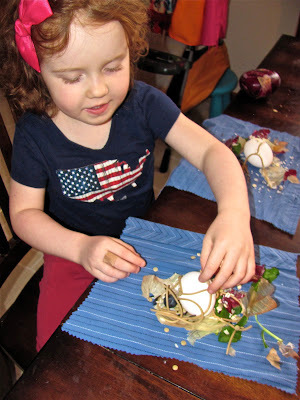 Once you have all the materials surrounding the egg, then you need to bundle up the fabric and tie it. Make it a fairly tight wrap, but don't break the egg! Don't they look cute? Reminds me of a meal I make: Rice Bundles! We'll have to do a posting of them! Now place the bundles in a pot and cover with cold water and add about a 1/2 Tablespoon of vinegar to the mix. The water should be about one or two inches above the eggs. Bring to a boil. Then reduce heat and simmer for 10-15 minutes. I lifted them out with tongs and set them on a baking rack. When they are cool enough to touch cut the string and you'll be in for a pleasant surprise! Again, I think they look absolutely AMAZING! I love the spaghetti and rice textures! I also love the touch of blueberry stain. Next time I would make a whole egg with a bunch of smashed blueberries. They have a very subtle look, but I've loved this technique since I was in elementary school! Cassie enjoyed seeing the result and guessing what all the items were! A little bit like opening a Christmas gift!! Yes, and they are edible hard boiled eggs too! Do you think you would want to try this technique? Do you have any ideas for different food items that you might add to this recipe for this naturally dyed marbling technique? 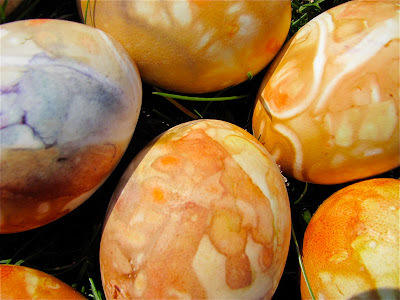 What are some of your special egg dyeing techniques? ***It sure would be nice to be in the Top 50 on Babble....Click here and give me a thumbs up! THANKS! These look great, and the process looks like so much fun! I also like the 2 for 1 egg painting idea below, terrific! Melissa, these are incredible! After destroying my kitchen and dining table with all of our crazy egg-dyeing experiments, I'm excited to try something a little tidier like this next time. You know I have a soft spot for surprises, and I would have ben so excited to open up each of these cute little packets. I LOVE it!!!! We'll be making these next! Those look awesome! I love how excited your little girl looks! Those look great! 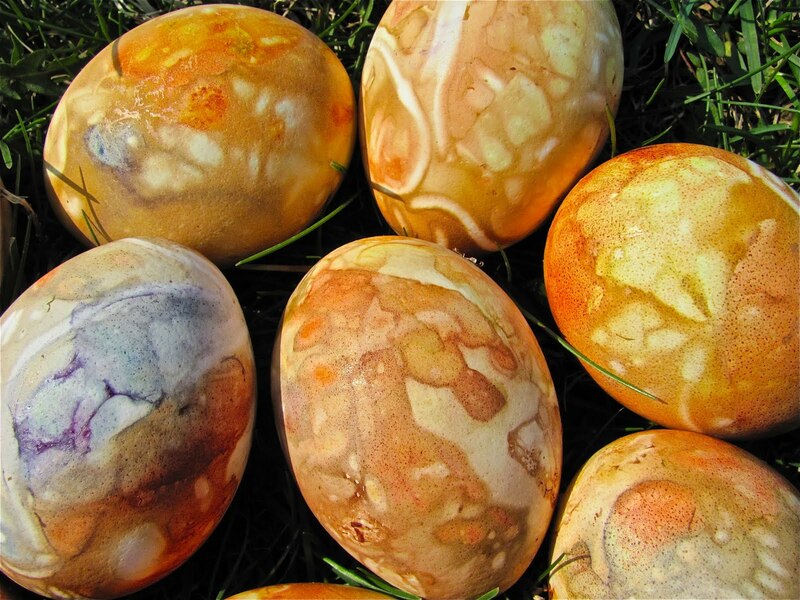 I've always wanted to naturally dye my eggs but never knew what to do. Thanks for the great tutorial. pomegranate pips (if you have any frozen, from fall or from the store) make a sweet pink texture! Thank you for stopping by at Kids Get Crafty!!! I have to say that although I wanted to do natural dyes, the thought of boiling each thing to make the color was more than I had time for. Bundling everything together and doing the whole boiling the eggs and color at the same time? Genius!! THIS I can do. Thank you! Yes, what an awesome idea..I may try this for our Easter Egg Hunt..Oh the possibilities.. Thanks, let me know how it goes for you. this is AWESOME!!! Love how cool they came out, never would have thought such a cool design would be at the outcome. Thanks! It is a wonderful surprise! I used some beets (cooked leftovers, red and yellow) and was surprised that I got the same yellow-brown that I got from the onion skins. I agree about the blueberries being lovely; our favorite egg was blueberry/spinach. I had jumbo shells for leftover pasta, so I punched out hearts and stars with a tiny cookie cutter. They gave a pretty resist. Do you simmer the eggs the whole time for the dye's sake, or is that your regular hard-boiled egg recipe? I usually turn the water off and cover the pot after reaching a simmer and would rather do that if it works. But I simmered the whole time per your recipe just in case. What a great idea to punch out hearts and stars! I just did my regular hardboiled recipe. I brought eggs to a boil then turned off heat and let sit for 15 minutes.